Sprinkle a little flour onto a sheet of parchment paper. Roll out the pastry shell until about 1/8 inch thick. In a small bowl combine olive oil, salt, pepper, and thyme. Brush about a ¼ of the mixture onto the center part of your pastry dough. Sprinkle the 2tbsp parmesan and all of the mozzarella onto that same middle square of the dough. Slice the tomatoes into ½ inch slices. Brush remaining ¾ of the olive oil mixture onto both sides of the tomatoes. Wash and chiffonade the basil leaves. Arrange tomatoes and half of the basil so that they are layered in the center of the pastry dough on top of the cheese. Leave about 1 & ½ inches of dough around all sides. 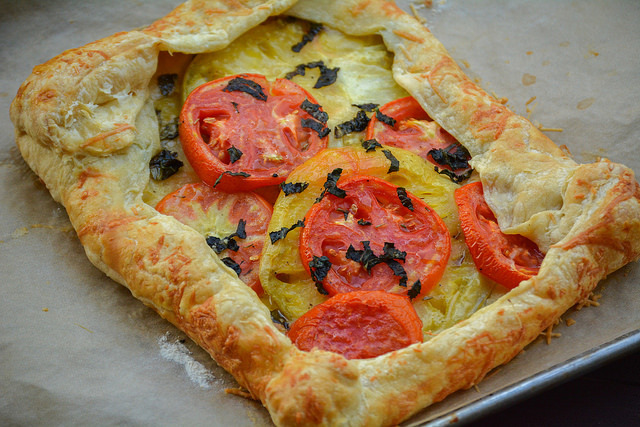 Fold up the edges of the pastry dough around the tomato layer. This will essentially form a crust. Fold and pinch the corners. Brush with egg wash (you will most likely not need the whole egg). Sprinkle remaining 1 tbsp of parmesan onto the crust. Finish with remaining chiffonade of basil to top. Serve immediately. I’ve had some serious pizza cravings lately but, it’s just too darn hot out most days to enjoy something that dense. I started thinking about how to beat these cravings without weighing down my plate. 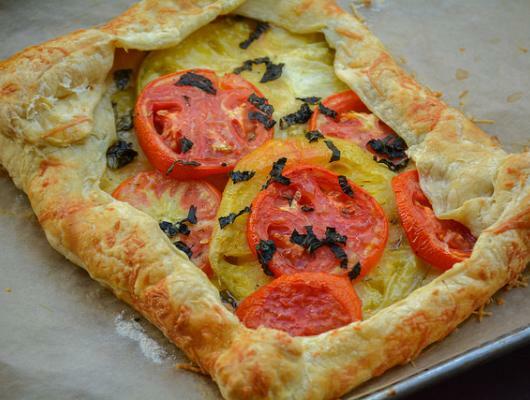 This sparked the great idea of making a tomato galette (a free form crusty “cake”). Making this recipe was the perfect opportunity to use up some farmers market finds for a much lighter take on the pizza concept. One quick note; if we’re being completely honest with each other, the term “galette” is used a bit loosely in this recipe (phew now that’s off my chest!). A galette is a French food term. It’s a free form crusty cake that can be sweet or savory and the dish traditionally includes buckwheat flour in the dough. The recipe for my galette below embodies the style of the typical galette however; I took the “easy” way out (you know you want to as well!). By easy, I’m referring to using pre-made puff pastry sheets instead of hand-making the dough. While it’s not a baking “win”, I can promise is that it still tastes fantastic! Now that you know what a galette is, here’s how we’re stuffing it today. Tomato, basil, and a touch of cheese make the perfect combination. The cheesy crust is irresistibly delicate and flakey. The tomatoes, when roasted in the olive oil and herbs, become tender and slightly sweet with crisp edges. The bright and aromatic basil is the secretly necessary ingredient. It balances out the sweet and salt flavors and provides a summer season essence.